For those with a slightly quirky sense of humour, and for those who are curious to see how new format for the exploitation of intellectual creations can be made to work with some of the most unlikely and surprising material, this may be of interest: the talented twosome of Matthew Buck and Michael Cross combine to provide a Pepysian-style account of contemporary events, couched in terms of the language and lifestyle of three centuries ago -- so for 2010 read 1710. 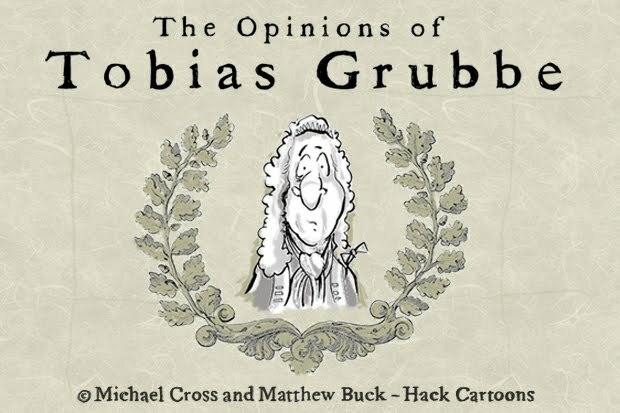 The diarist, "Tobias Grubbe", has taken root within the safe haven of Monday's Telegraph. 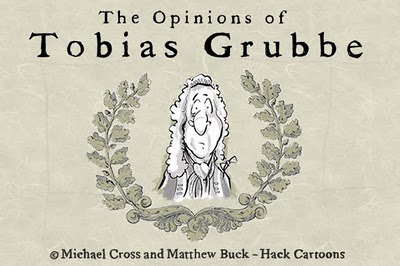 Tobias Grubbe -- actually a jobbing scrivener -- sells advertising space inside his product -- "even to hard-bitten lawyers, litigators, rights managers and their firms". While the notion of exploiting copyright-protected works by making them a vehicle for advertising is not of itself new, the fact that it can be achieved with such unusual material should encourage other creators not to despair of finding a medium that will work for their creative output too. The 15th July 1710, St Swithin's Day. Weather: Mist, Rain & Fog. Up and to Murdoch's coffee house to read the news, but the way was barred by two toughs bearing Bludgeons, demanding money, viz £1.0Sh. to enter for one day, or £1.0Sh.0d. to enter for 30 days. Certain that the offer was a Gull, I made instead to Bridgerush's establishment, but there was too much Noise to think, a situation which did not seem to discommode Bridgerush's Hirelings, who joined in with a Shrill Tone. On to the Seven Starres, where several Periwigged gentlemen entreated me to furnish drinks Pro Bono. I could not see Bono, who I think a Minstrel, but I took a quart of Sack with one Chancecliffe, who explained that the legal business is come on hard times. Master Halliwell is confined to the Fleet Prison, and even Mssrs Fresh & Field required to Tighten their Waistbands. I took the Opportunity to explain that the Patrons of my weekly Article, which is displayed every Monday at the window of the most visited Quality Print Shop in the City, enjoy better fortune, and that, thanks to the latest Media Techniques, such favourable Publick Exposure is available at a very generous rate. (Mem to self : to be further informed, press Here). Home late O'the Clock, by way of Tyburn Tree, where a wench sold me for 1d a lock of hair from the head of the Highwayman Moot. Click here for more articles and some musical accompaniment.